Amy Rowe (Bachelor of Social Sciences) participated in the study tour International Development in Vietnam in July, 2017. The following article consists of feedback received from Amy, and the abstract and conclusion of her final assignment for the study tour. 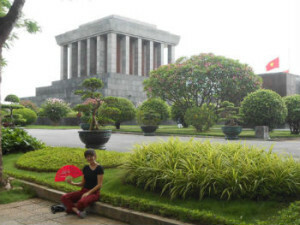 My international development study tour to Vietnam was breathtaking and has left a lasting impression. I view the world so much differently now that I have seen how lucky we are here in Australia compared to other nations. This course has given me the confidence to pursue foreign development aid work in the future. My ultimate goal after university is to undergo an international volunteering project, but I didn’t feel comfortable doing that until I had some practice. This course allowed me to open my eyes and experience the real world in all its aspects. This is something I have wanted to do for all of my academic career and am so pleased with how well it exceeded my expectations. What I have learnt and the memories will last a life time. “Villages in the north of Vietnam are greatly affected by the cycle of poverty due to a combination of demographics. There has been an effort to reduce poverty by creating a sustainable local economy through village home stays for international tourists. This form of rural tourism has a focus on community engagement and cultural exchange. The scheme has heavy NGO support combined with micro financing programs. 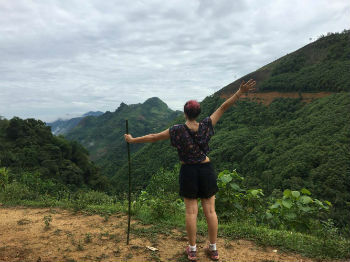 This entry was posted in Asia, Faculty of Arts, Student Videos, Study Tours, Vietnam and tagged Faculty of Arts, hiking, international development practice, Study Tours, travel, Vietnam, volunteering. Bookmark the permalink.